Woven by women to adorn tents and camel caravans, kilims are enduring records of life in Turkey’s nomadic communities, as well as stunning examples of abstract art. This exhibition marked the public debut of treasures from the museum’s Murad Megalli collection of Anatolian kilims dating from the eighteenth and nineteenth centuries. Kilim, Central Anatolia, late 18th century. The Textile Museum 2013.2.1. The Megalli Collection. 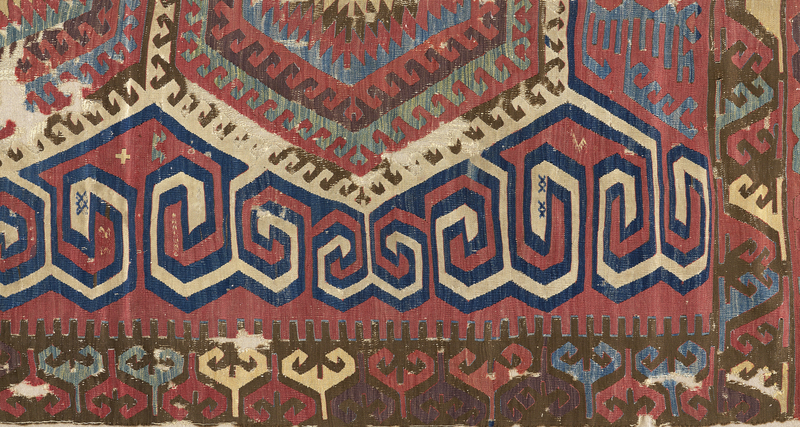 Kilim (detail), Central Anatolia, late 18th century. The Textile Museum 2013.2.1. The Megalli Collection. Kilim, Central Anatolia, 18th century. The Textile Museum 2013.2.13. The Megalli Collection. 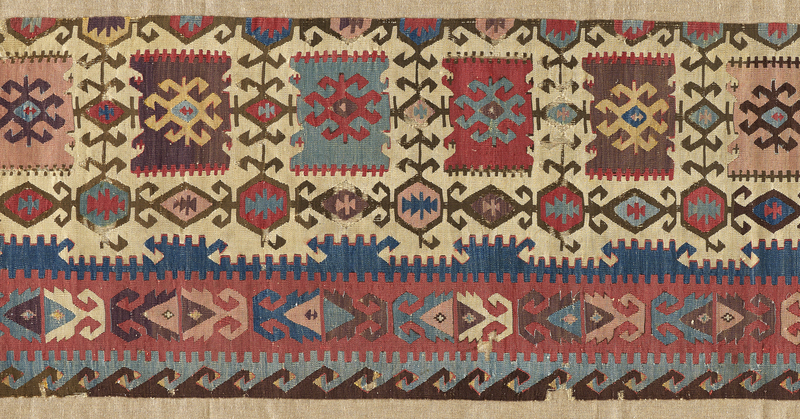 Kilim, Central Anatolia, possibly east-central, mid-19th century. The Textile Museum 2013.2.19. The Megalli Collection. 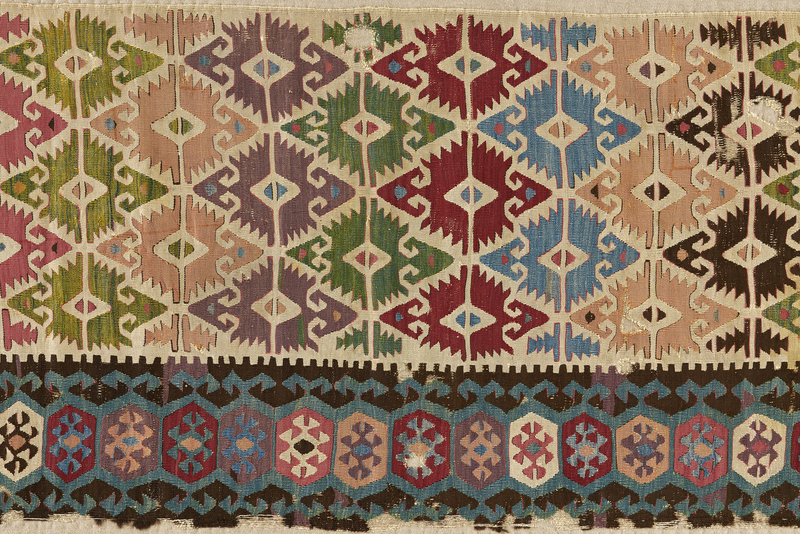 Kilim (detail), Central Anatolia, possibly east-central, mid-19th century. The Textile Museum 2013.2.19. The Megalli Collection. 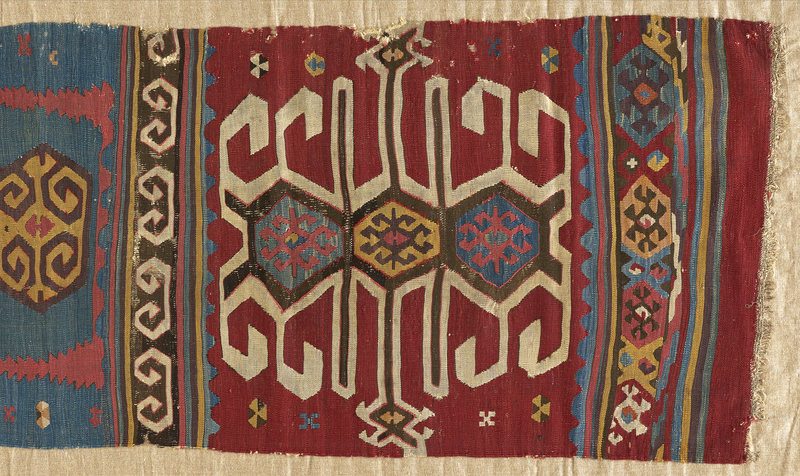 Kilim, Central Anatolia, possibly west-central, early 19th century. The Textile Museum 2013.2.30. The Megalli Collection. 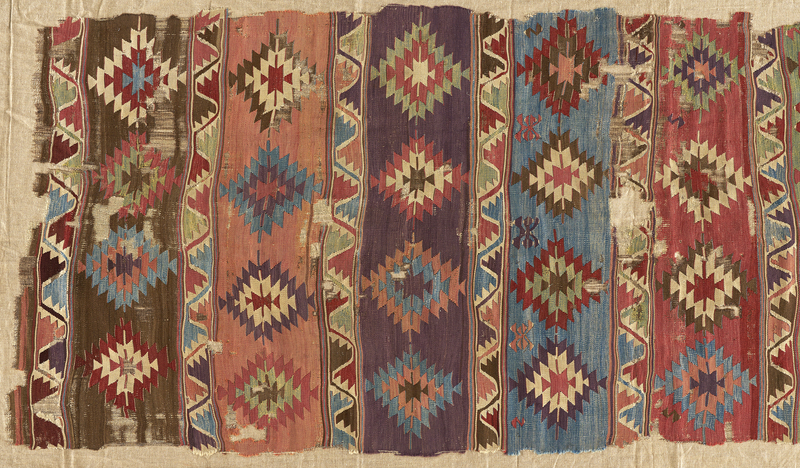 Kilim (detail), Central Anatolia, possibly west-central, early 19th century. The Textile Museum 2013.2.30. The Megalli Collection. Kilim (detail), Central Anatolia, early 19th century. The Textile Museum 2013.2.31. The Megalli Collection. Kilim (detail), Central Anatolia, ca. 1750–1800. The Textile Museum 2013.2.32. The Megalli Collection. Kilim, Central Anatolia, ca. 1800–1850. The Textile Museum 2013.2.47. The Megalli Collection. Kilim, Western Anatolia, ca. 1750–1800. The Textile Museum 2013.2.71. The Megalli Collection. Kilim (detail), Central Anatolia, 19th century. The Textile Museum 2013.2.73. The Megalli Collection. Kilim, Central Anatolia, 19th century. The Textile Museum 2013.2.90. The Megalli Collection. Kilim (detail), Central Anatolia, 19th century. The Textile Museum 2013.2.90. The Megalli Collection.